A popular hiking and running trail in Austin, Texas, has over 2.6 million visits every year—reflecting the city’s recent growth, including increased downtown residential and office development. The hiking trail runs around Lady Bird Lake and at one point passes beneath a large automobile bridge: the Ann Richards-Congress Avenue Bridge. That area had become a safety concern due to a tight curve that created a collision threat for pedestrians and cyclists. Therefore, a new pedestrian bridge was designed to replace a decades-old wooden one—linking the trail east to west with a reconfigured radius that improves visibility. 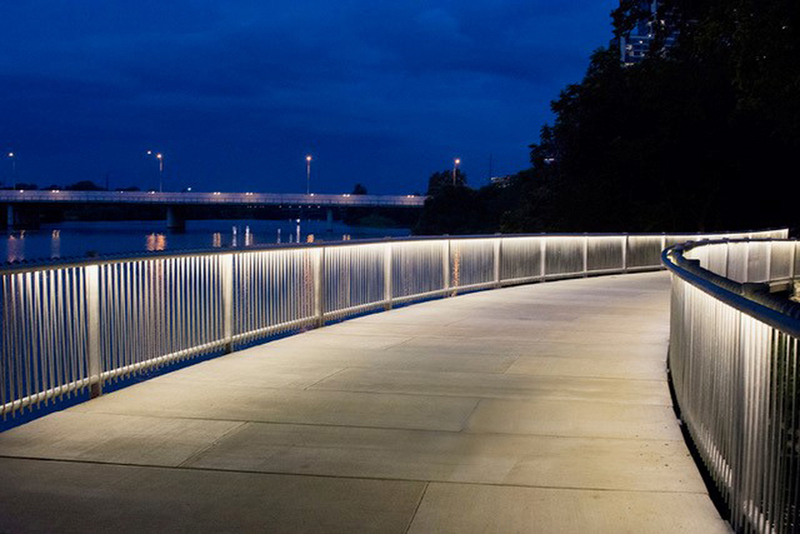 The new pedestrian bridge design was meant to be “as beautifully simple as possible and cost-efficient,” says landscape designer Claire Hempel, principal of landscape architect Design Workshop Austin. In contrast, the handrail was designed to be like jewelry—structurally sound while also intricate, with lighting built into the handrail itself. When Mark Herzer, principal for Specification Sales at the lighting specifier for this project, Spectrum Lighting Austin, saw the curvature of the handrail, he said only one product would do the job: iLight Plexineon LED fixtures. 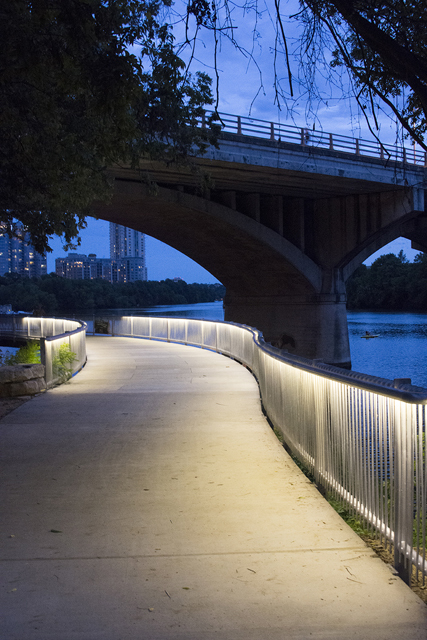 Plexineon handrail seamlessly flows with the curves of the trail as they cross under Congress Avenue Bridge. So iLight worked closely with engineers Freese & Nichols, Inc., on the alignment and power issues. They used 455 linear feet of Plexineon White 2X 2800. “When doing these types of projects, iLight is a great resource because of their excellent service,” Herzer says.